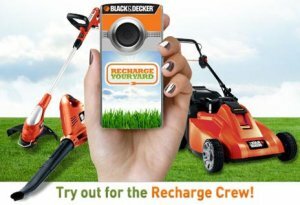 I spotted this giveaway on the Black & Decker Facebook page the other day, where they are giving away some of their new cordless lawn tools and a custom Flip Mino HD cam. They want video of people using their tools (probably to use for advertising), so they are giving away the tools and the camera. To apply to win you must fill out a form and in 200 words or less explain to B&D why you should be chosen to receive a cordless mower, cordless string trimmer, cordless blower, and Flip camera. Don't feel like pleading your case to B&D in 200 words or less? No worries, Charles & Hudson is also giving away a B&D cordless mower. It is powered by 36 volts and retails for about $450.